The past twenty years have witnessed a major change in commercial aviation. Deregulation, significantly increased competition, and the incredible increases in the cost of fuel have completely re-written this industry. Aircraft design has concentrated on developing aircraft with much improved fuel economy. Increased uses of carbon fiber and composite materials have resulted in lighter, stronger aircraft. Modern ceramic materials are employed in jet engine design for smaller, lighter more powerful models that also have added safety margins. Flight control policy has developed to more accurately schedule commercial flights so that there is much less time spent waiting for landing slots. This results in less waste of time and significant fuel savings. Perhaps the largest savings have resulted in changes in airline routing procedures where the most efficient type of aircraft is selected for each route. Long haul routes with large numbers of passengers are assigned to large multi-engine wide body aircraft. Many airlines now employ hubs to collect passengers for these high density routes. The spokes of the hubs use smaller aircraft to service smaller markets. The smaller regional airlines use many different smaller aircraft ranging from mid size jets through smaller prop planes, and even commuter and smaller taxi type craft. Passengers, of course, vary in size and weight. Their luggage will also vary from passenger to passenger. But when there is a large enough group of passengers, the average total weight will be quite constant, within standard statistical deviations. Regulations have been developed to use this average weight, with a safety factor, to determine the carrying capacity of the aircraft. For smaller aircraft with fewer passengers, there will be much wider statistical deviations seen. Therefore, the safety factor has to be much larger. This is quite inefficient for the airline, as they may be forced to reduce the number of passengers carried. This has prompted operators of smaller aircraft to obtain accurate, rugged weighing scales to obtain actual passenger and luggage weight. Industrial scales are often used for this purpose. Where accurate weights are recorded, the airline may schedule a full load for the smaller aircraft without needing to account for statistical deviations. This can result in much more efficient use of the airplane, with subsequent savings of cost and fuel, and increased profitability. The electronic scales used for this purpose must have a number of important characteristics. Obviously, the scale must be quite accurate. The scale platform must be large enough to comfortably accommodate even very large passengers. It should have a low platform height, making it easy for elderly passengers or children to step up onto the scale platform. The digital indication of weight must be very easy to read with little chance of operator error. Platform scales are ideal for this purpose. Arlyn Scales provides this type of scale with a very low platform height of only 1 7/8′. 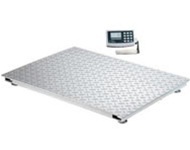 The platform is manufactured from welded aluminum treadplate, providing a very rugged digital scale. It is also light in weight, so that it may easily be moved to different areas within a facility. This electronic scale has a large 20′ x 27′ platform, so that it will easily way all types of passengers, and luggage and cargo in almost any format. The digital indicator provides large, graphics digits, so that the scale operator may easily see the accurate weight without errors. It is usually required to record all weights. To perform this function, these industrial scales may be equipped with a number of different communication options. A serial protocol known as RS-232 had been the most popular method for many years. Most small computer systems had connectors for this. More recently, these RS-232 interfaces have not been included on personal computers. Instead, the Universal Serial Bus (USB) has become very widespread. Platform scales are now available with this choice. Another popular alternative is an Ethernet port. This communication standard is used throughout the computer world. Most facilities will already provide Ethernet connections associated with their own Local Area Networks. Arlyn Scales also provides this option for their digital scales. As an added advantage, appropriate software may be used to make the scale data available through the Local Area Network to the Internet. This allows weight data from the platform scales to be recorded and viewed from any approved computer within the entire organization.